On this page i will focus mostly on two Southeast African countries: Mozambique and Madagascar. As these countries stand out for having well-documented links with the Afro-Diaspora in the Americas. Ancestral ties which can be verified and counterchecked by both genetics and history. And in some cases even personal family stories! 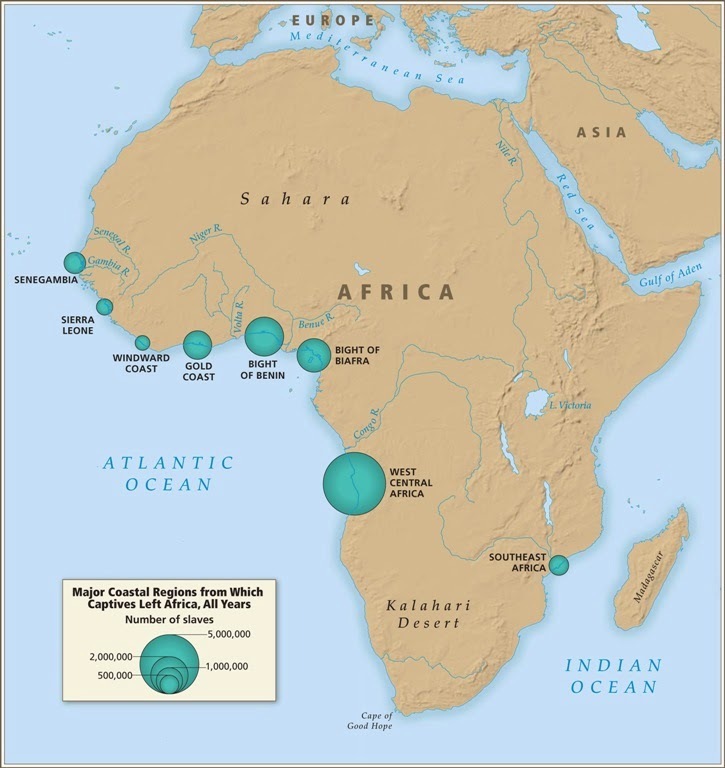 When compared to Atlantic Africa this area was much less frequently visited by European slave traders, due to distance and logistics mainly. But it is still a potential region of (partial) provenance for many Afro-descendants. It is known that especially during the 1800’s many Southeast African captives were transported from places situated far into the interior. This might have also affected populations nowadays residing in Zambia and Zimbabwe. However as these connections are rather speculative and still under study i will restrict myself for now to only discussing Malawi in addition. For this country solid evidence of participation in the Trans Atlantic Slave Trade does indeed exist. The first two maps show the relatively minor importance of the Southeast African slave trade when compared with the one originating from West and Central Africa. Still high numbers of captives were involved. The first map also shows how for other parts of the Afro-Diaspora (located in the Middle East, South Asia and the Indian Ocean islands) countries such as Kenya and Tanzania are of confirmed ancestral significance as well. However aside from a handfull of atypical Trans Atlantic voyages departing from Zanzibar and Mombasa there doesn’t seem to be any concrete evidence of the Americas ever having received substantial numbers of captives from the socalled Swahili Coast (and its interior). This map shows the ancestral locations and/or ethnic backgrounds of socalled Recaptives who were interviewed in Sierra Leone around 1850. They were brought there, after having departed from slaveports in Mozambique all the way on the other side of the continent! The slave ships carrying them to most likely either Brazil or Cuba were however captured by the British fleet. It is a limited sample and reflecting a very late timeperiod, but still illuminating. Notice there’s also mention of a few Yao persons from Malawi. 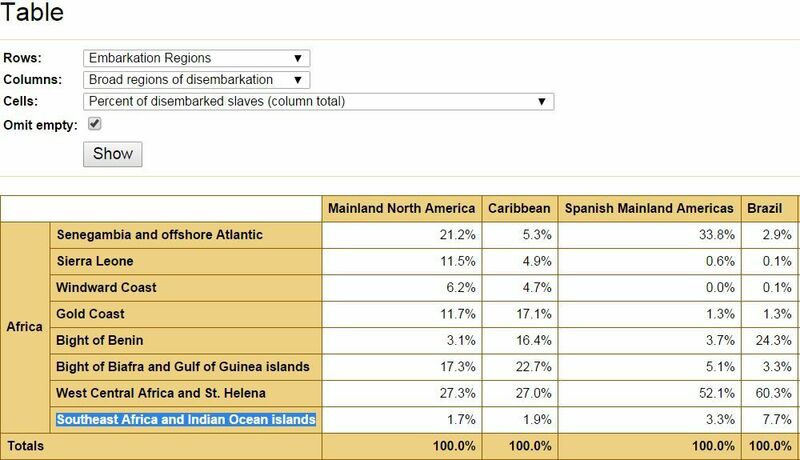 The next five charts are all taken from the SlaveVoyages Database. 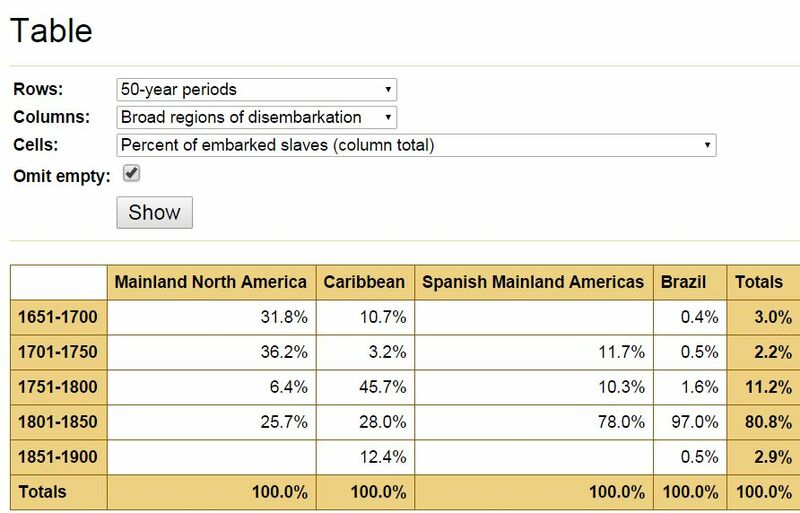 However the first two ones taken from their separate estimates page rather than the documented slavevoyages section. 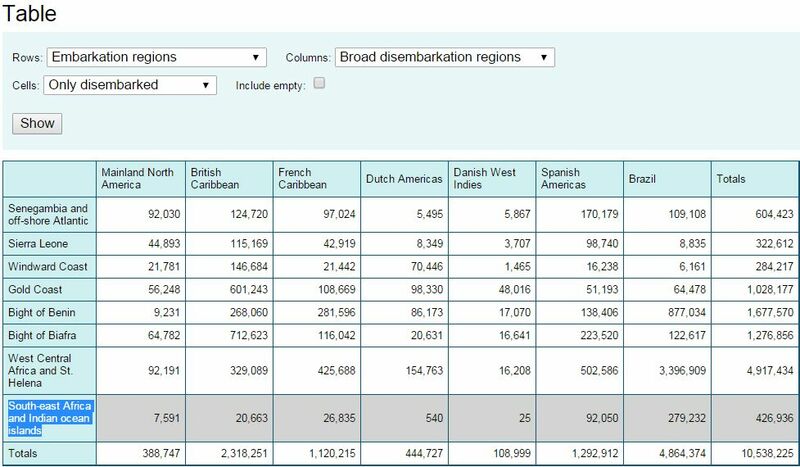 According to this source about 427.000 people or almost half a million Southeast Africans are estimated to have arrived in the Americas. The greatest number by far in Brazil. For the US the estimated number would be around 7500. Within North America the greatest numbers disembarked in the Northern States & Virginia. However also the Carolina’s and Louisiana received Southeast African captives by way of slave voyages directly from Africa. Almost all of them being from Mozambique rather than from Madagascar though. Malagasy captives and their descendants could still have ended up in the Deep South indirectly by way of Inter-Colonial slave trade with the West Indies, and especially Barbados, and even more so by way of Domestic Slave trade with especially Virginia. 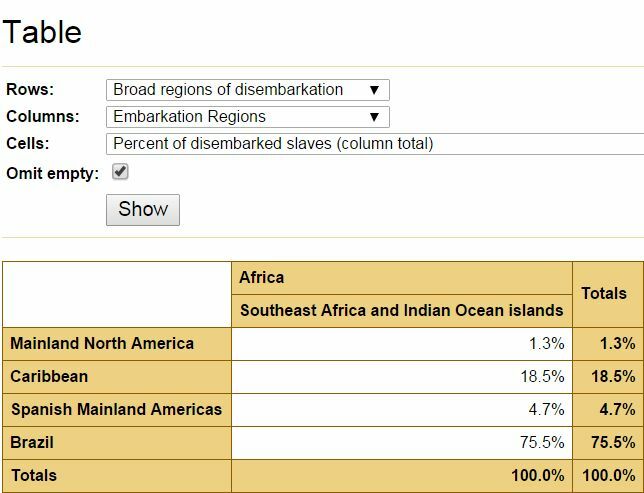 This chart shows where the Southeast Africans from documented slavevoyages have ended up proportionally speaking. It’s clearly Brazil where most Southeast Africans were taken to, more than 75% of the total. Next comes the Caribbean, which is mostly due to Cuba and Haiti. For practically all destinations in the Americas Southeast Africa has the smallest share when compared with other African embarkation regions. As can be verified from the chart below. The highest share is calculated for Brazil with 7,7% while the lowest share is 1,7% for the USA. 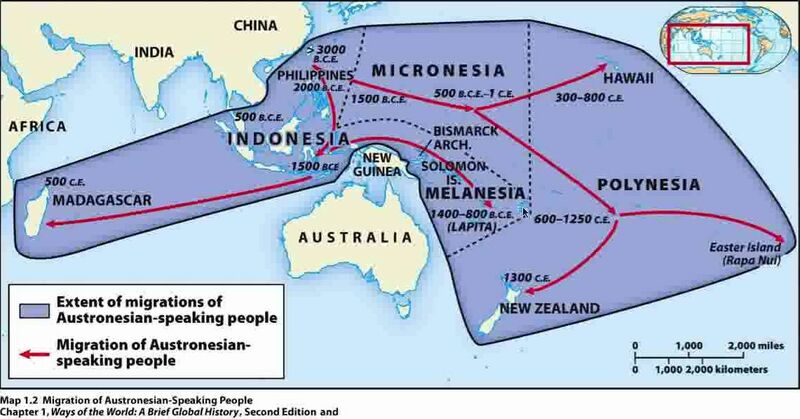 This chart is showing during which timeperiod most of the Southeast Africans would have arrived in each destination. A crucial piece of information for anyone wishing to trace back their ancestry to Southeast Africa. The USA received most Southeast African captives during the earliest timeperiods (1650-1750). While for Brazil it’s much more concentrated in just one single timeperiod: 1800-1850. This information could have major implications for both the degrees of expected dilution of bloodlines as well as any widespread dispersion due to an early founding effect. This last chart is comparing the percentage of Madagascar captives with those from the slave port of Mozambique (not the country!). 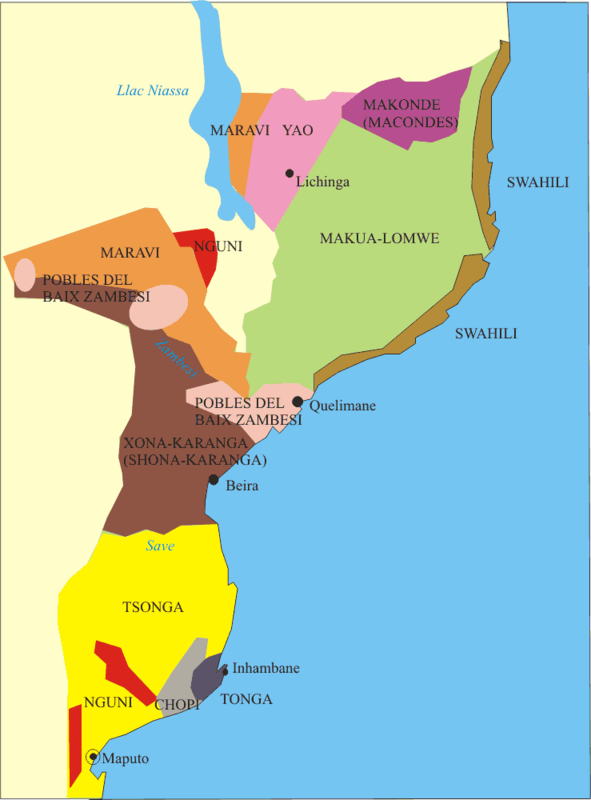 The presentday country of Mozambique was named after this island fortress but actually there were several more slave ports located in Mozambique and other parts of Southeast Africa. 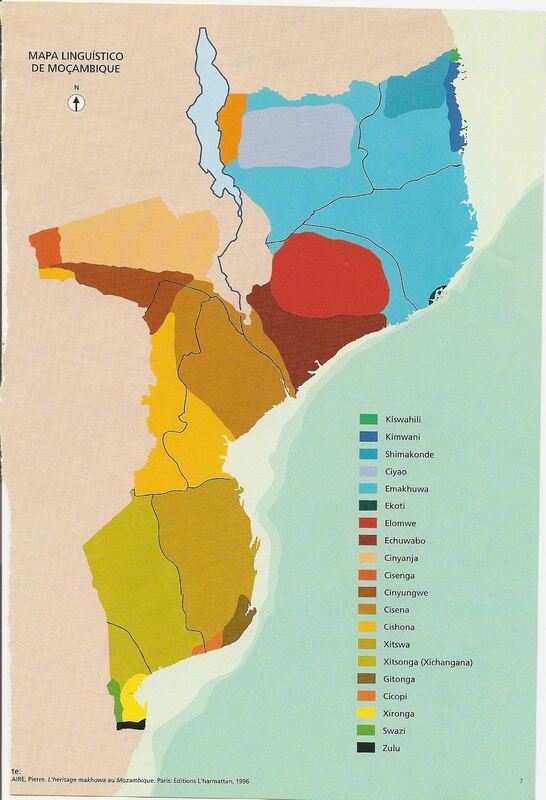 But Mozambique (the slave port) was firstmost in importance for almost all destinations in the Americas. For a complete overview see this chart. The striking thing about the chart below is that the USA clearly stands out as the only American destination where Madagascar captives were a majority among Southeast Africans. minor Southeast Asian percentages (usually inbetween 0,5%-2%) being reported for a multitude of African Americans tested on 23andme. minor but still noticeable frequency of haplogroups associated with Malagasy ancestry among African Americans tested on 23andme. frequent occurence of shared DNA segments between DNA tested Malagasy and African Americans. 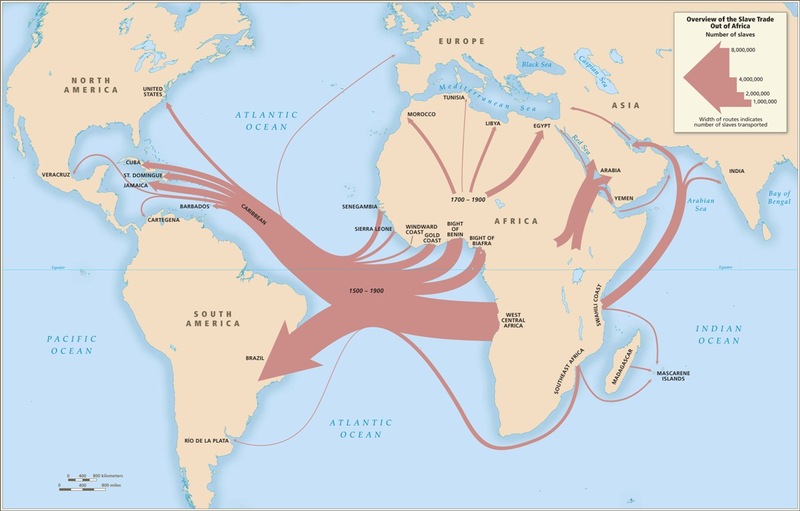 Unlike most other destinations in the Americas it was Madagascar rather than Mozambique which provided most of the Southeast African captives to the USA. Also unlike most other destinations (safe for the Anglo Caribbean) these captives arrived mostly during an early timeperiod (1650-1750). For several reasons it seems they may have been in a favourable position to have relatively many descendants who due to the Domestic Slave trade also ended up in the Deep South aside from Virginia and the Northern states where they were initially concentrated. 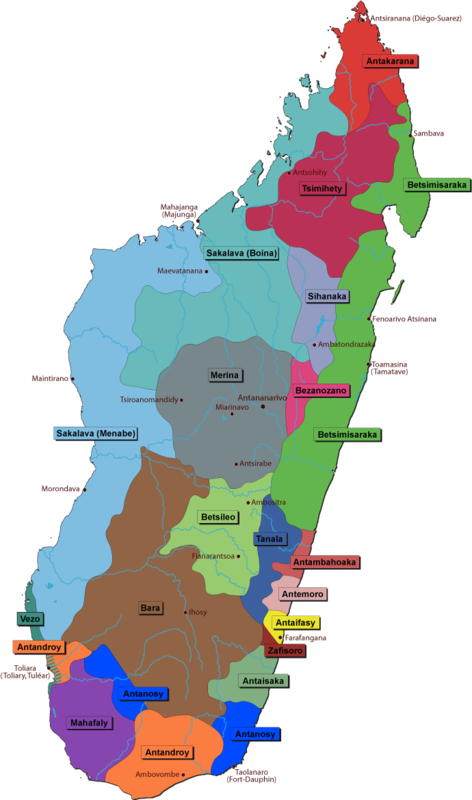 The very fortunate circumstance about tracing any possible Madagascar ancestry is that it can be confirmed much more easily by way of the unique Southeast Asian component in Malagasy genetics and the inheritance of these markers among their descendants in the Americas. The first map below explains how this came to be. 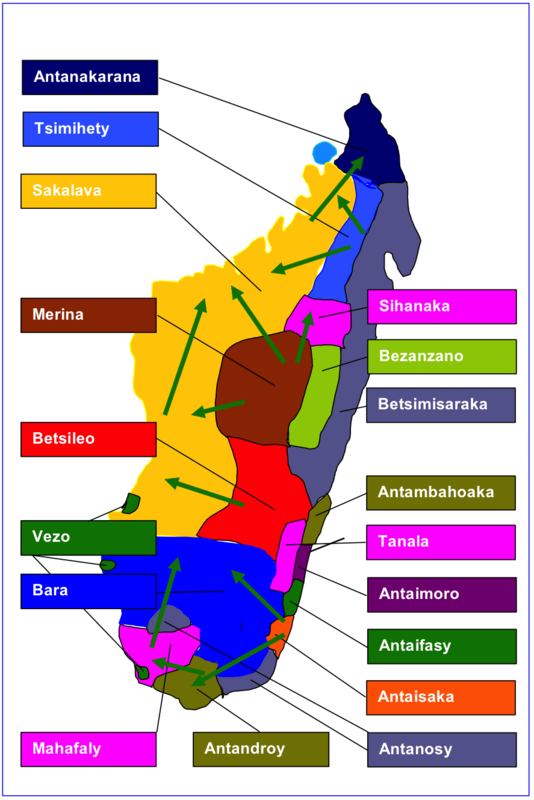 The Malagasy are however not a homogenously blended group but rather consisting of many diverse ethnic (sub)groups. Undoubtedly they will therefore show much individual variation themselves in their admixture compositions. If we were to make a purely hypothetical assumption that on average the Malagasy arriving in the US might have been a 50/50 mix of Southeast Asian and Southeast African. It then becomes an interesting excercise to speculate on what a percentage of inbetween 0.5%-2% Southeast Asian on 23andme might imply about the generational distance and also the potential number of Malagassy ancestors relocated to the US. Again in most cases it will probably represent a single and very diluted family lineage. But either way it will be ancestry which is relatively easier to track and possibly even identify. This country is not quickly associated with Trans Atlantic Slave Trade, atleast not by popular imagination. 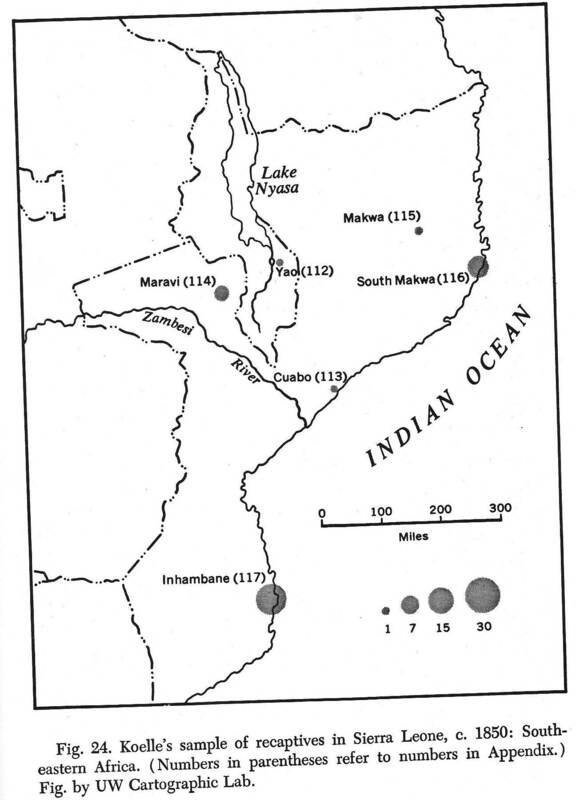 However unlike for some other widely claimed and apparently more fanciful places of origins in eastern Africa, hard evidence does exist of Malawi’s involvement in sending captives to the Americas by way of Mozambican slaveports. 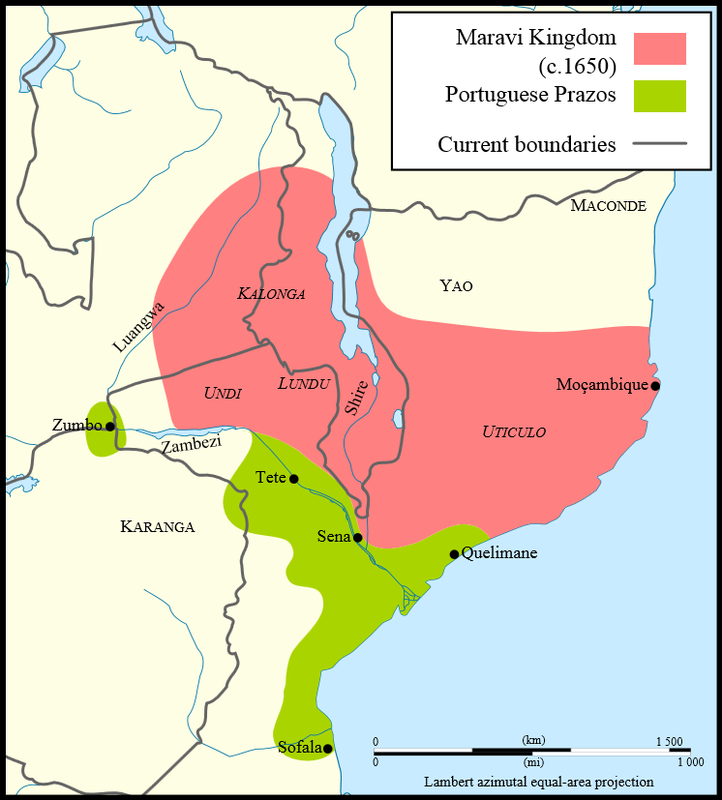 Most notably the Maravi kingdom was possibly already being visited by the Portuguese in the 1500’s/1600’s. In later centuries it was rather the Yao people who were preferred middlemen, also for the Omani/Swahili. Still at times they also ended up being taken as captive themselves (e.g. see the recaptives map in the beginning of this page). For more details see these wikipedia links.